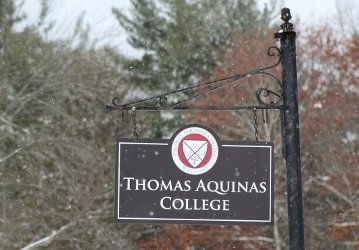 Dozens of Thomas Aquinas College freshmen gathered in St. Cecilia Hall Thursday afternoon to learn about an intriguing possibility: completing their course of studies at the College’s newly approved campus in Northfield, Massachusetts. After an opening prayer, Dean John J. Goyette explained the transfer opportunity. Having received the approval of the Massachusetts Board of Higher Education, the College is now free to recruit students and accept applications for the New England campus. It will begin admitting freshmen — and transferring sophomores — to Massachusetts pending the approval of its accrediting agency, the WASC Senior College and University Commission, which is anticipated in the near future. Dr. Goyette then showed the students some photos and a video of the New England campus, after which they were greeted by a surprise guest: Admissions Counselor Patrick Cross, who works on the Massachusetts campus and spoke via video from the Merrill-Keep residence hall. Mr. Cross led the group on a virtual tour of the building, after which he and Dr. Goyette answered a wide range of questions, many of which returned to the subject of northeastern seasons. Dean John Goyette and Admissions Counselor Patrick Cross (via video) answer students’ questions. “It’s below freezing today,” said Mr. Cross. “In fact, we’re going to get snow tonight” — at which point the entire auditorium cheered.